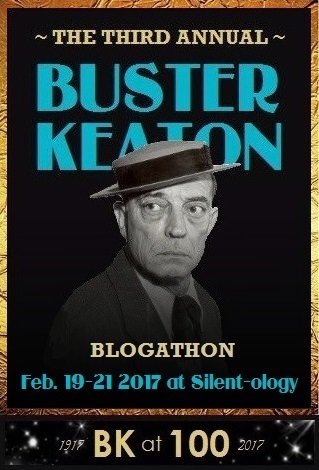 This post is part of the “Things I Learned from the Movies” blogathon hosted by Silver Screenings and Speakeasy. 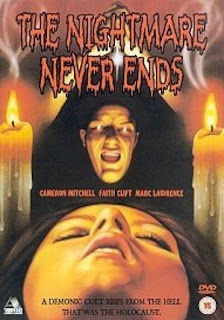 On the other hand, over the years, horror movie titles have given me excellent advice, which I will share with you now. 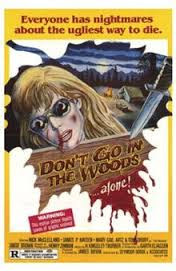 In the early days of home video, I believe James Bryant’s alpine slasher film was titled Don’t Go in the Woods but modern releases have used the longer title Don’t Go in the Woods…Alone! While the former title is perhaps too general to be taken realistically as advice, the more recent title is brilliantly succinct and one of the best imaginable guidelines for living one’s life. Indeed, if there is anything I have learned from the movies, it is Don’t Go in the Woods…Alone! 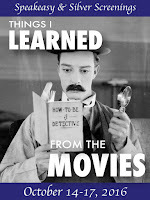 (The title could be further improved by replacing “in” with “into,” as the original title could imply only a prohibition of certain lavatorial activities—though such an implication also serves as excellent advice). Personally, I have never gone in the woods...alone and I am certain my life is the better for it. 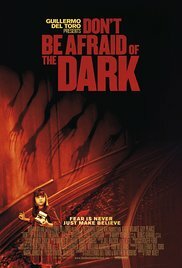 Another excellent lesson is provided by the title Don't Be Afraid of the Dark. As the beloved TV movie and the less beloved but still entertaining remake illustrate, it is not the dark itself, but what lurks in the dark, that will get you. Whispering creatures aside, the movies have shown us time and time again that there are things in the dark that are best avoided, such as ghosts, slashers, dolls, scarecrows, large insects, regular-size insects, vampires, androids, zombies, man-made monsters, terrorists, mountain men, clowns, swamp creatures, aliens, large reptiles, regular-size reptiles, witches, boogeymen, mummies, parasites, sasquatches, morticians, demons, fairies, mutants, mutant babies, evil babies, possessed babies, zombie babies, cenobites, werewolves, rats, blobs, rabid dogs, puppets, gremlins, sharks, cannibals, leprechauns, elder gods, escaped lunatics, yetis, bats, golems, dinosaurs, and other such hazards. But the dark itself is nothing to fear. 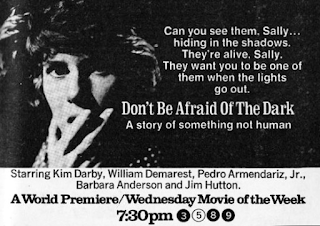 On the occasions I have felt some trepidation due to exploring dark places, I have said to myself, "Wasn't there a TV movie called Don't Be Afraid of the Dark? Why yes, yes there was," and that thought reminded me there was no reason to fear the dark. Some might say that the advice presented in S.F. Brownrigg's movie title is too general to be of much use, but I say it must be obeyed. 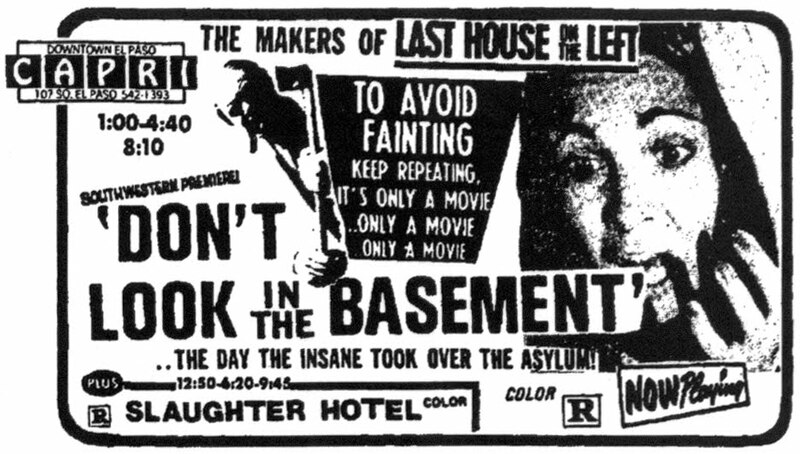 There is almost never a call to look in the basement, and when there is such a call, the appropriate response is to ignore it. There are two kinds of basements. In the first kind, there is nothing to see worth seeing. Perhaps a water heater, some cardboard boxes, and an old washer/dryer, but nothing worth looking at. 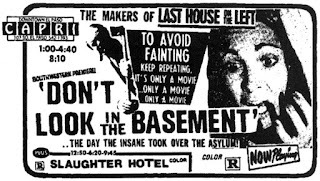 In the second kind, there is something hiding in the basement that should not be seen, perhaps a ghost, slasher, doll, scarecrow, large insect, etc. For both kinds of basements, Mr. Brownrigg's advice is equally helpful. I myself have looked in several basements and have never found the experience satisfying. I stand by Mr. Brownrigg's advice. 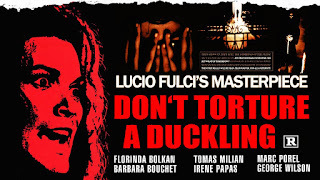 Outside of the fact that torturing any animal is cruel and unjustifiable, the advice presented in Lucio Fulci's rural giallo is still important and practical. Even though the film's literal duckling is just a Donald Duck toy that provides a clue to the murderer's identity, the advice is equally good for both plastic and avian ducklings. In Mr. Fulci's film, both kinds of duckling can be seen as symbols of childhood and innocence. 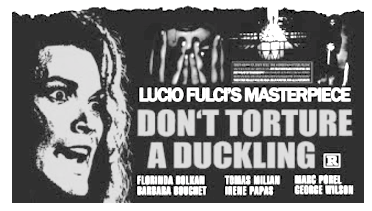 The contrast between the words "duckling" and "torture" in the title reflects the film's concerns about the dichotomy between the traditional and modern, concerns also reflected visually in the opening shots of rolling hills interrupted by a massive concrete superhighway, and in other shots contrasting stone hovels and ultramodern apartments, and in the narrative contrast between superstition and modern police work. I am proud to say that in my lifetime, when faced with the opportunity to torture a duckling, I have abstained, and I believe my life has been the better for it. 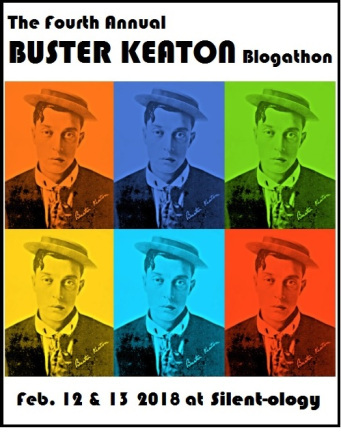 During the month of October, we celebrate horror films more intensely than during other months, but those of us attuned to the poetry of these films know that their pleasures are not strictly seasonal and it is our duty to celebrate them throughout the year. The truest advice for those of us who are constantly listening for the distant siren song of nightmare cinema, is to always remember that The Nightmare Never Ends. The first movie reviewed on Senseless Cinema is The Nightmare Never Ends, aka Cataclysm or Satan's Supper. Of all the indelible images in that paragon of philosophical cinema, one image stands as a testament to a final lesson that all of us can learn from the movies: the lesson of experiencing pure joy, as demonstrated through the timeless and magical image of Cameron Mitchell disco dancing. 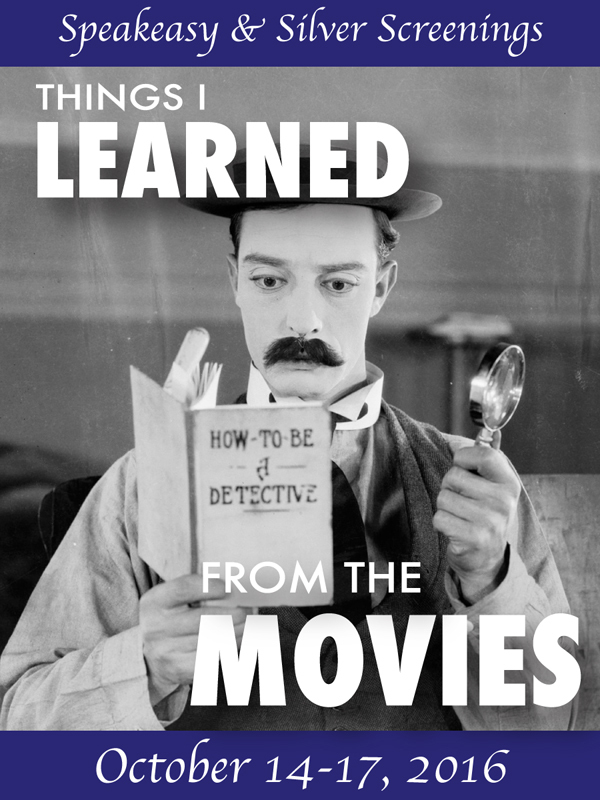 All of this is not to say that every movie title provides good advice. Based on the titles above, one would be forgiven for thinking that movie titles are a panacea for one's problems. However, this is far from true. Surprisingly, one could even be steered wrong by titles that begin with the word Don't. For example, Don't Look Now should be considered useless advice for all but the vision impaired and the very, very nearsighted. Don't Go in the House, while no doubt well intended advice, particularly when a man with a flamethrower is lurking about, would also strain the limits of practicality if taken literally. Similarly, titles such as I Drink Your Blood and I Eat Your Skin, while they might make an entertaining if uneven double bill, serve as relatively impractical life advice. Similarly, Taste the Blood of Dracula is right out. 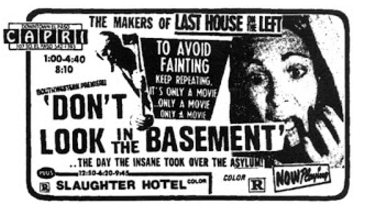 Upon further reflection, I would say that when it comes to advice from horror movie titles, one would be advised to keep a grain of salt handy.